At the beginning of August, I wrote a blog on the importance of correcting your pH and the benefits that this can bring to you and your land. Lime spreaders have been working at full capacity across the UK since then and it has served as a reminder of just how many different liming products are available. As a result, I thought it would be helpful to write a blog highlighting some of the options available; specifically the main types of bulk and granular lime we come across and the benefits that they can bring. Remember: When looking at RB209 recommendations, these are given in terms of t/ha limestone based on a neutralising value (NV) of 50-55. When thinking about the possibility of other products mentioned in this blog, the difference in NV and fineness will need to be considered as it has a significant impact on the effectiveness of liming. Limestone/chalk is the most popular liming product that we create recommendations for here at the SOYL office. The advantage of calcium lime is that it specifically targets the pH problems within the field without bringing any other nutrients into the equation. When applied at the correct rates and the correct target pH, limestone only needs to be applied once (roughly) every four years. The required frequency of applications can vary from farm to farm depending on soil types, while application timings can be dependent on crop rotations. Magnesium limestone, or MagLime, usually has an NV between 50 and 55 and is applied at similar rates to ground limestone. This product can offer great benefits but, if used incorrectly, can cause issues. Careful planning and consideration are really important. The big advantage of using this is that it can help to correct magnesium deficiency at the same time. For the product to be classed as MagLime, there must be a minimum 15% MgO. Although the idea of applying fresh magnesium can be appealing, using this product excessively over a number of years can bring its own problems. 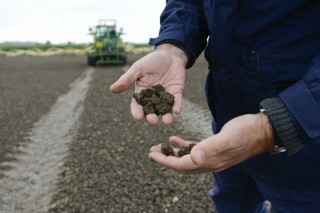 High Mg levels within the soil can have a negative effect on potash availability, as well as soil structure and drainage. If this is your choice of product it requires some very careful management – ensure you regularly monitor soil magnesium levels and use the product in moderation. When applying this product variably, you should also be aware of targeting acidic areas of the field as this can mean high amounts of magnesium applied where it is not needed. On the flip side, any pH areas above the lime target will not receive any Mg even if there is a requirement. LimeX is a by-product of the sugar manufacturing process at British Sugar. Generally, because of the production process it goes through, LimeX is finer than calcium lime and MagLime. Due to the finer composition of LimeX, reactivity within the soil happens quickly and pH is corrected more rapidly. LimeX has a lower NV of between 22 -32. This means that a higher maximum rate is required to ensure a three-to-four year impact, or that slightly more frequent applications are made. As well as lime, LimeX offers varying amounts of other nutrients when applied to land, as shown in the above graphic. This can result in nutrients being applied to areas where P indices may be high and there would be no requirement. On the other hand, if indices are low for P, this would help to increase them to the levels required. Granular lime is very finely ground limestone which is then combined into spreadable granules, similar in size to fertiliser. By creating a granule, contractors are not required and it can be applied using a standard fertiliser spreader. This allows application at any time of year and to growing crops, unlike conventional ground lime. Due to the fineness of the limestone with which the product is created, granular lime is quick to react within the soil and increase your pH. This makes it ideal for correcting pH levels that may be detrimental to crop growth, particularly in cases where a crop has already been sown before the problem was noticed. Applying large amounts of granular lime for a long term adjustment may not be an economical solution for maintaining or improving pH levels. However, as a 'fire fighting' solution or a little-and-often application to defined areas, it is ideal to ensure final yields are not impacted. Think about your rotation – do you grow acid-sensitive crops? What are your nutrient indices like? Could something like Magnesium limestone or Limex be beneficial? Do you need a quick result for one year? Consider the possible use of a granulated lime.